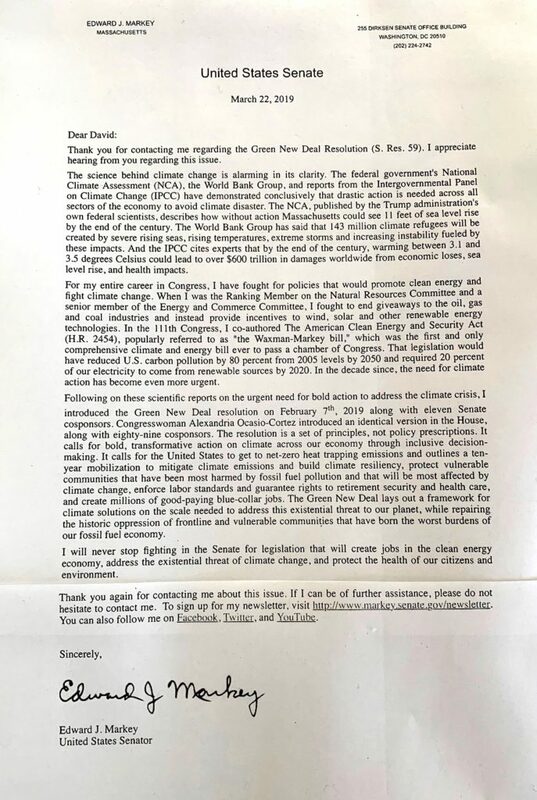 Email to Senator Markey 8thFebruary 2019. I believe I can help sell your Green New Deal to skeptics, especially Republicans who control the Senate. We have cut the carbon emissions of our home in Dover by almost 90% in the last four years. We did this by retrofitting our 1970s house with heat pumps, insulation, triple-glazed windows and solar panels. All installed by local, hard-working plumbers, electricians and carpenters. The best part of “going zero” is that we are saving about $9,000 a year in heating and electric bills. The savings will pay for the retrofit in about eight years. Our return on investment is about 11% per year after tax, which sure beats my 401k! We are saving money by saving the planet. I believe this is the inflection point, the turning point, the point of no return. You said it yourself, “The sun is setting on the dirty energy of the past.” You can now make money by “going zero”. Making money is possible because the technologies of heat pumps, triple-glazed windows and solar panels have improved greatly and have tumbled in price. It is also because Massachusetts has smart policies such as: net metering for electricity, the MassSave program for subsidizing insulation, incentives for heat pumps and the new SMART solar subsidy. Massachusetts has led the way for your Green New Deal. As you say in your Senate Resolution, we need to, “upgrade all existing U.S. buildings…to achieve maximum energy efficiency.” It is now possible to massively scale-up “going zero” because every home or business owner would make money. “Going zero” is no longer being driven by a hippy environmentalism, it is being driven by cold, hard cash in your pocket. To move from the inspiring language of the Green New Deal resolution to the action needed to deliver on its promises you will need concrete plans. Making money by going zero on your home, office or factory should be one of them. I know this might sound like it is unreal or that I am exaggerating. But I assure you it is very real. If you would like to send an aide to see my house, my electric bills that say, “No payment due” and my very carefully recorded results I would be happy to accommodate them. Yes, and my family name really is Green. I am not making that up either. Woot! Look What I Can Do! Great news! Making money by cutting your carbon footprint to zero is a new reality. I own a large house built in the 1970s. I’ve already cut its energy bills and carbon footprint to zero, making a 15% return on investment in the process (see my previous Zero Energy Project blog post for details). Now I’ve done the same on my swimming pool. It was quicker, cheaper, and made a higher return on investment to “go zero” on our pool than it did on our house. By “going zero” on our pool I saved about $3,000 a year and cut about 9 tons of carbon dioxide emissions a year. We did this by installing energy saving devices that I call the “pool fab four”: a new variable-speed pool-water circulating pump, an electric-powered pool vacuum/cleaner, a heat pump pool heater and about five solar panels to power it all. 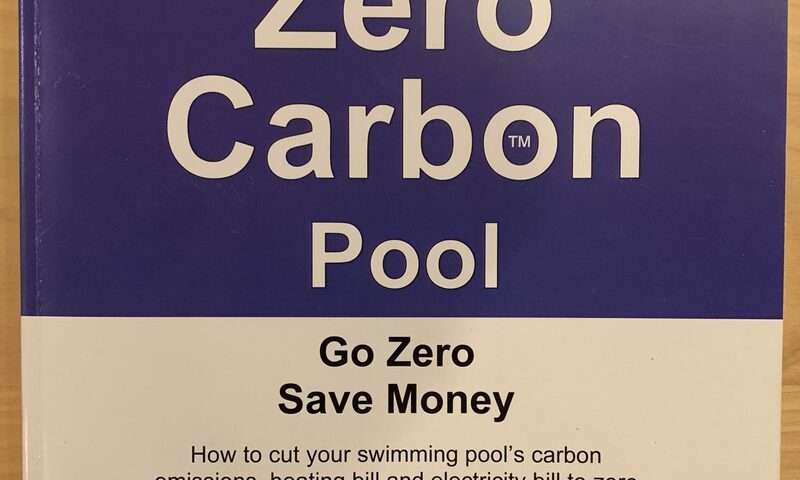 Going zero on our house saved us about $11,000 a year and cut our carbon footprint about 43 tons per year, so the savings on the pool made a significant addition to my total gain from going zero in the first place. I am a physicist by training so I have a solid understanding of technologies like solar panels, heat pumps, and pool-water circulating pumps. I also have an MBA from Harvard Business School and spent 20 years as President or CEO of private and public companies. So I also understand how to use discounted cash flow analysis (the standard way companies analyze investments) to make financial calculations like internal rate of return (IRR, a measure of return on investment) and payback period (how long it takes to get your investment back). I keep detailed records of my pool’s propane and electricity use in order to measure the effect of each improvement we made to our pool. My results are based on my own experience rather than generalized claims made by manufacturers or installers. I replaced my old fixed-speed pool-water circulating pump with a variable-speed pool-water circulating pump and set its speed to the lowest setting needed to circulate all the pool water once each day, the rate of exchange required to keep the water clean. This reduced the pump speed from 3,450 rpm for about 12 hours a day to about 2,000 rpm for 24 hours per day. The laws of physics state that the electricity used by a pump goes up as the cube of the rpm, so slowing the pump down more than compensates for the doubling of the time that the pump is on. This effect is so powerful that it cut the electricity used to circulate the water by 87%, saving us over $2,000 a year. The new pump paid for itself in the first year with a return on investment of 100% a year. I wish I could invest my 401k in pool pumps! I installed an electric-powered Dolphin™ pool vacuum/cleaner to replace the old pump-driven pool vacuum cleaner. This is safe because it is connected to a GFCI (ground-fault circuit interrupter) electrical socket and because we take it out of the pool and disconnect it whenever anyone is in the water. This alone saved us about 2,000 kilowatt-hours of electricity per year or over $400 worth. It pays for itself in about 3 years with a return on investment of 55% per year. This keeps the pool cleaner too, which eliminates the dreaded summer rite of scrubbing algae off the walls of the pool. We use the pool only in summer, so an air-source heat pump pool heater is appropriate. My pool heat pump is about four to six times as efficient as my old propane-fired heater. In many areas, electricity is also less expensive than propane as a fuel in dollars per btu delivered, if you use the electricity to run a heat pump. We installed a single heat pump, one designed especially for pools, at a total installed cost of $6,000. The savings on the propane bills, after accounting for the extra electricity the heat pump uses, will pay for the heat pump in about 16 years. That’s a return on investment of about 4% per year after tax. I did not add a pool bubble blanket to insulate the pool. This is because with the heat pump and solar panels, the cost of heating our pool is very low, just over $100 a year. This is using the highest measure of the cost of electricity from my solar panels (7 cents per kilowatt-hour) and was calculated as the total installed cost of the panels divided by the guaranteed electricity output of the panels. The running cost of my solar panels is zero. Including the storage rack, a pool bubble blanket for our pool would cost about $1,000 and might last ten years (the warranty is eight years) for an annual cost of about $100 a year. Spending $100 a year on a pool blanket to save a small fraction of $100 a year in heating costs makes no sense. We didn’t like the idea of having a large piece of rolled up bubble-wrap in the garden either. We did not use a pool chemical blanket either. Pool chemical blankets are liquids, usually alcohols, you pour into the pool that create a thin layer on the surface that reduces evaporation (and heat loss) from the pool. Over four weeks in the summer of 2017 I did experiments with and without a pool chemical blanket. I found that they do reduce the loss in temperature of the pool overnight by about 1°F (the pool naturally loses about 2-3°F overnight) but they cost about $50 a week. I can replace that lost heat with my heat pump and solar panels at about a third of that cost and with none of that inconvenience. I opted not to install the standard unglazed, mat-style solar hot-water panels because solar electric (photovoltaic or P.V.) panels powering a heat-pump water heater are more cost effective. Plus, the net-metering agreement with our utility allows us to accumulate a credit for excess electricity generated on sunny days so we can use that electricity on cloudy days. With solar hot-water panels you are out of luck getting warm water on cloudy days and there’s less opportunity to store the excess from sunny days. You can learn more about the combination of photovoltaic panel and heat pump water heaters in this blog post. Instead of installing solar panels only to power your swimming pool, you are better off installing solar panels for your house and installing a few extra to power your pool. Instead of installing solar hot-water panels, I covered the roof of my house with a 15kW array of 46 Sunpower 345W panels and covered the roof of my garage with a 13kW array of 40 Sunpower 327W panels. That sounds like a lot of solar panels, but I make money on every solar panel. Solar panels are cheaper than they have ever been and are heavily subsidized. My total investment in solar panels, after the tax breaks and subsidies, was about $42,000. My savings are over $5,500 per year on electricity bills. My investment in solar PV panels produces power at about 7 cents per kilowatt-hour (after tax breaks and subsidies). That’s about one-third of what I would have paid my electric utility company here in Massachusetts, which is now 23 cents per kilowatt-hour. The solar panels will pay for themselves in about 7 years. But the most important economic measurement is the internal rate of return (IRR): 13% per year after taxes. My overall investment (after tax breaks and subsidies on the solar panels) for the entire zero-energy retrofit of my pool was about $10,000 and I am saving about $3,000 a year on propane and electricity bills. The investments pay for themselves in just over 3 years and the IRR is about 44% after tax. That handsomely beats the growth of the Standard & Poor’s 500 stock index of 11.7% over the last 43 years. It also beats the return on investment we achieved by going zero on our house, which was about 15% per year. Additionally, the S&P return is before tax and before fees whereas my return is after tax and with no fees. Finally, financial markets are risky especially when seeking the highest returns. The risk associated with energy efficiency improvements and solar are usually nil and are will increase with inflation. Much as I found with going zero on our house, the conventional wisdom on going zero on a pool was often wrong and did not make financial sense. I found that using the standard financial evaluation process used by companies and investors together with some simple experiments cut through the myths. So I think I’ve found a way to both go zero and make money. This represents an inflection point for the zero energy movement. Going zero is no longer like buying an expensive lifestyle statement for your house or pool. It’s cold, hard cash in your pocket, proving you can save money and save the planet! You can read more about my experience and a summary of my books, Zero Carbon Home and Zero Carbon Pool, detailing how I did it all atGreenZeroCarbonHome.com. David Green lives and works in Dover, Massachusetts. Swimming Pool Owners Can Save About $1,000 a Year by Cutting Their Pool’s Carbon Footprint to Zero. A new book, Zero Carbon Pool, has been published. Zero Carbon Pool is the roadmap for how to make money by cutting a typical in-ground pool’s carbon footprint to zero. It was written by someone who has done it: David Green, author of Zero Carbon Home. Press Release(EIN Presswire) – DOVER, Mass. – Dec 22, 2018. The UN reported that we have 12 years to limit a climate change catastrophe of droughts, floods, and poverty. The Camp fire in California was the deadliest in the U.S. in a century. 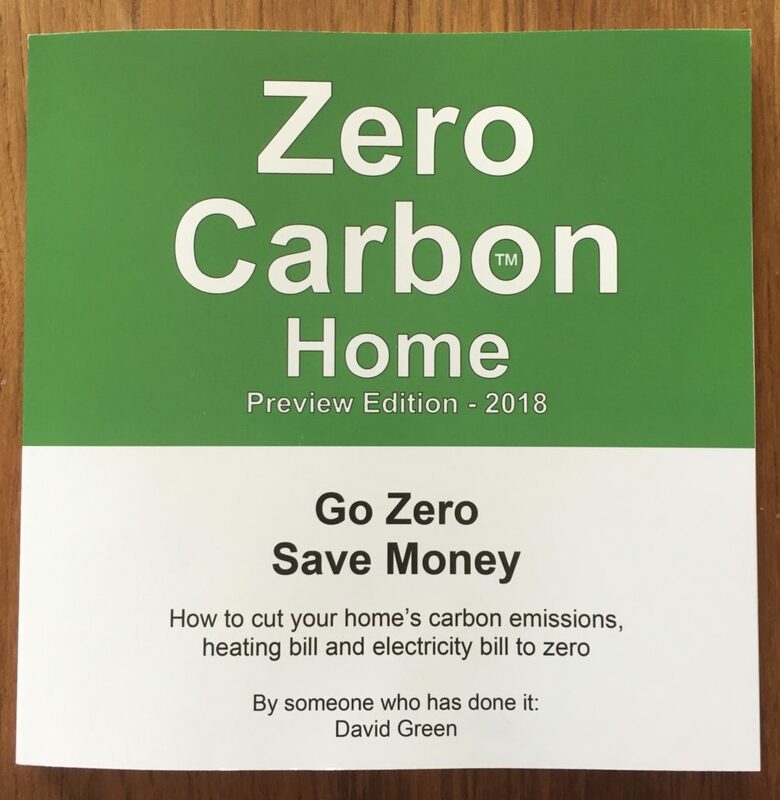 Go zero and save money with David Green’s new booksZero Carbon PoolandZero Carbon Homeon how to save money by drastically cutting your carbon footprint.To stop climate change, start at home. Start now by giving the gift of Zero Carbon Home or Zero Carbon Pool this holiday season. They’re the gifts that keeps on giving. Please note that the Green family is saving about $3,000 a year but their swimming pool is 28’ wide by 60’ long and so is larger than average. Savings on a typical 20’ by 40’ pool in New England would likely be about $1,000 a year. Press Release(ePRNews.com) – DOVER, Mass. – Dec 19, 2018 – Recently, it’s been all bad news. The UN reported that we have 12 years to limit a climate change catastrophe of droughts, floods, and poverty. The U.S. warned that climate change would kill thousands and reduce GDP by 10% and the Camp fire in California was the deadliest in the U.S. in a century. Now, the good news. Author David Green’s new book, Zero Carbon Home, is the roadmap for how to make money by drastically cutting a home’s carbon footprint. By installing the “fab four” – heat pumps, insulation, triple-glazed windows, and solar panels on his own home in Dover, Massachusetts, he has cut the carbon dioxide gas emissions from his home by 40 tons a year. That’s each year, every year, forever. The even better news is that he is saving $11,000 a year in heating and electricity bills. His return on investment is about 15% a year. This handily beats the 9.8% annual return on the S&P500 over the last 90 years. To stop climate change, start at home. Start now by giving the gift of Zero Carbon Homethis holiday season. It’s the gift that keeps on giving. David Green holds a BA in physics (with Honors) from Oxford University and an MBA from Harvard Business School (with distinction). He founded and was CEO of two biotechnology companies. He took both public and has raised over $100m in capital. He retired from biotech in 2015 and has turned his energies to combating climate change – one home at a time. His first book is “Zero Carbon Home” and his second book is “Zero Carbon Pool.” His work has been publicized by the Department of Energy, Zero Carbon Project and Cool Effects. The following are unsolicited comments from readers of the book: “Wow that was an awesome book! D.S., Mastic, New York. “Absolutely loved the book.” A.N., Weston, Massachusetts. “I’m very impressed the way you explained the technical terms…. Really good stuff.” M.B., London, U.K., and this comment came from probably the world’s leading environmentalist: “I thought the book was straightforward and clear,” B. Mc., Middlebury, Vermont. 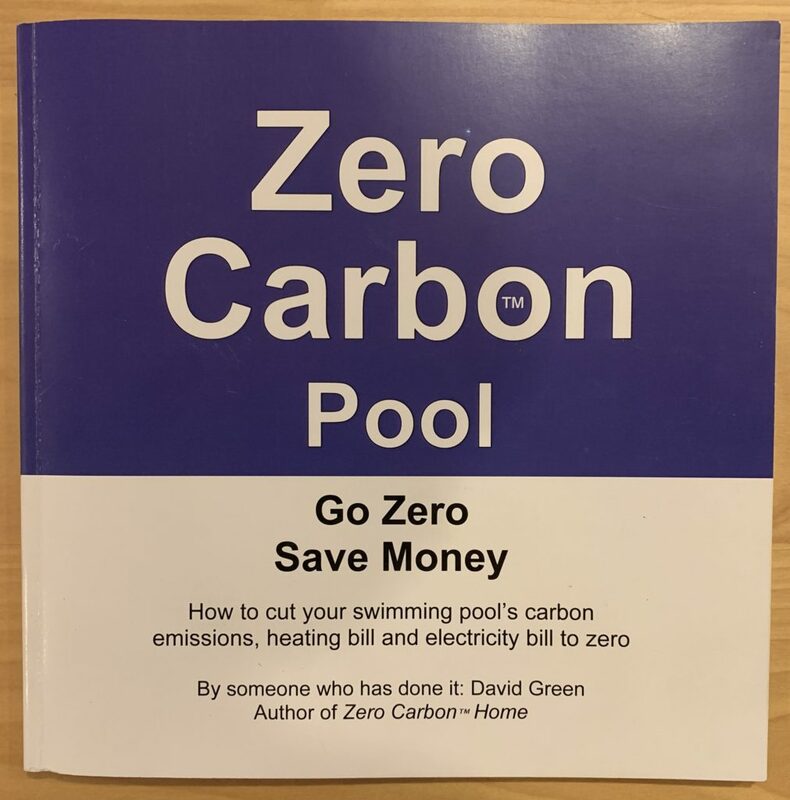 David Green, the author of Zero Carbon Home, has released his second book, Zero Carbon Pool. Zero Carbon Pool, just like Zero Carbon Home, is about how to save money by cutting your carbon footprint. Zero Carbon Pool is about how to cut your swimming pool’s carbon emissions, heating bill and electricity bill to zero. David Green has done it on his own swimming pool. He found it was quicker, cheaper and made him a better return on investment to go zero on his pool than on his house. Written in the same friendly style and backed by the same scientifically and financially rigorous analysis as Zero Carbon Home, this book will help you save money by helping to save the planet from global warming. David Green holds a BA in physics from Oxford University (with honors) and an MBA from Harvard Business School (with distinction). He founded, and took public, two biotechnology companies before turning his energy to helping people save money by dramatically cutting their carbon footprints. It is easy to calculate the carbon footprint of your home. You can calculate your carbon footprint from your heating and electricity bills. Just find the most recent ones and follow the guidance in this article. All the conversion factors are in a table at the end of this article. For electricity, the bills usually have the full last year of energy use. The energy in electricity is measured in kilowatt-hours (kWh). Each kilowatt-hour of electricity you use that is generated by a power station costs you between 15-23c depending on where you live. Rooftop solar panels (after the subsidies and tax credits) can generate power from your roof at between 3c and 9c per kilowatt-hour, see hereso it is much cheaper to generate your own electricity than to buy it from a utility. Using one kilowatt-hour of electricity causes, on average, about 1 pound of carbon dioxide to be emitted by a power station. Generating electricity from solar panels emits zero carbon dioxide, see here. The carbon footprint of electricity varies from about 0 pounds of carbon dioxide per kilowatt-hour if the electricity is generated by hydropower to about 2 pounds per kilowatt-hour at coal-fired power stations. So just take the number of kilowatt-hours of electricity on your bill for the last year and it is roughly equal to the number of pounds of carbon dioxide emitted. Heating oil and propane are usually reported in gallons delivered rather than gallons used but if you take what is delivered over a full year it will be pretty close to actual use. If the full year’s delivery is not written on the bill just call your delivery company and ask for the last full year’s deliveries. Burning heating oil emits about 24 pounds of carbon dioxide per gallon so just multiply the number of gallons by 24 to get the pounds of carbon dioxide emitted from heating oil. Propane emit about 13 pounds per gallon so just multiply the gallons delivered in a full year by 13. Burning natural gas emits about 12 pounds of carbon dioxide per Therm or 120 pounds per million BTUs. BTU is short for British Thermal Unit. A Therm is 100,000 BTUs. Like kilowatt-hours, both are units of energy. So just multiply the number of Therms used by 12 to get the pounds of carbon dioxide emitted from burning natural gas. If your bill is in millions of BTUs (sometimes written MMBTU) then multiply the number of million BTUs used by 120. You can greatly reduce the carbon footprint caused by heating your house by installing heat pumps to replace, or supplement, your furnace. See here. If you have heat pumps powered by your own solar panels then you can heat your house with a zero-carbon footprint. See here. Heating your house with heat pumps powered by electricity is from solar panels is now the cheapest way to heat your house, even cheaper than heating it with natural gas. Then just add up the total pounds of carbon dioxide emitted by your house from heating and from electricity. This gives you the total primary carbon footprint of your house in pounds of carbon dioxide. If you prefer to see it in tons, just divide the number of pounds by 2,000. If you came out to somewhere between 5 tons and 50 tons you probably did the calculations correctly. If you had 1,000 gallons of heating oil delivered in the last year, which is fairly typical in Massachusetts, then you emitted 1,000 gallons x 24lbs CO2/gallon = 24,000lbs of carbon dioxide from burning heating oil. 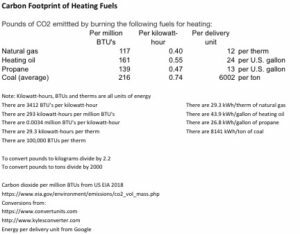 If you used 1,000 Therms (100 million BTUs) of natural gas, which is also fairly typical in Massachusetts, then you emitted 1,000 Therms x 12lbs CO2/Therm = 12,000lbs of carbon dioxide from burning natural gas. If, in addition, you used 7,000 kilowatt-hours of electricity, again about average in Massachusetts, then you caused about 7,000lbs of carbon dioxide emissions from power stations burning fuels to make the electricity you used. So in the heating oil example your total emission of carbon dioxide was 7,000lbs + 24,000lbs = 31,000lbs (15.5 tons). In the natural gas example it was 7,000lbs + 12,000lbs = 19,000lbs (9.5 tons). If you found this post helpful you will almost certainly find the book, Zero Carbon Home, even more helpful. It is written in the same easy-to-read style backed by the same rigorous scientific approach and financial analysis. The book costs $20 and is available by clicking here. How much money did we save and how much carbon dioxide did we cut? In addition, the DOE estimates our house value has increased $111,000. 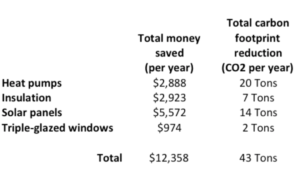 Please note that for triple-glazed windows the investment and savings are the additional costs and savings above that for double-glazed equivalents. Please see Chapter 4 in Zero Carbon Home for details. Is a zero carbon home the same as a net zero energy home? If you found this page interesting you will almost certainly find the book, Zero Carbon Home, helpful. It is written in the same easy-to-read style backed by the same rigorous scientific approach and detailed financial analysis. The book costs $20 and is available by clicking here.